I’m having a hard time containing my excitement for CSS grid: a spec thats been in the works for a while, but is finally here! News of grid has been exploding in popularity on the web as its becoming increasingly implemented in browsers (upvote here for Edge). Firefox also just came out with a pretty sweet Grid editing view in its developer tools, and I imagine Chrome will soon, too. I had been hearing about grid for a while but never really understood its real potential until I actually used it. And oh my gosh is it going to make our lives so much better! CSS Grid is one of the most well-thought-out and powerful CSS specs I’ve seen in a long time. Now, there are a lot of awesome tutorials and learning resources out there (linked at the bottom of this post), so this post isn’t going to be a full on how-to guide, but instead about why CSS grid is so good! Hopefully it’ll convince you to give it a try! Grid has a few ways to lay out templates, including a new unit called the fr, or fractional, ala a fractional part of the space. My favorite part of the new templating features is grid-template-areas! This allows you to create named areas that correspond to grid-template-columns and grid-template-rows in your layout. You can literally write out a map of your design! See the Pen CSS Grid + Flexbox Layout Demo with Fallback by Una Kravets (@una) on CodePen. Fallbacks in flexbox are possible, but are a bit more hacky and require more lines of code. I’ve even found that writing layouts using CSS Grid first is a good paradigm for understanding how the layout itself flows, which then allows for easier writing of a Flexbox fallback, such as in the initial example. CSS Grid implements grid-gap which creates a gutter between your elements. This is a problem we’ve been trying to solve for ages with responsive web design grids. Previously, you would need to use margins for element spacing in your flexbox or float-based grid systems. This also meant weird hacks to remove the margins we don’t want (such as the ones around the sides, top, and bottom of our grid container). My point is: CSS grid fixes all of this. It places gutters between elements where they’re most commonly intended to be in one line of very clear and concise CSS. There is a lot of power in a few lines of code right here, and allows for elements to be flexible within their grids but at a certain point stop decreasing/increasing in size. That means you might not need media queries and even better, it brings us one step closer to element queries where elements flex based on the size of their individual container and not the size of the browser window. See the Pen CSS Grid + Flexbox Layout Demo -- minmax by Una Kravets (@una) on CodePen. The CSS grid spec provides a lot of powerful features for developers and designers, and will make layout on the web immensely easier and much more semantic. It just works, and I’m almost angry it’s so easy. Also note that CSS Grid isn’t a replacement for Flexbox. They work together in unison. 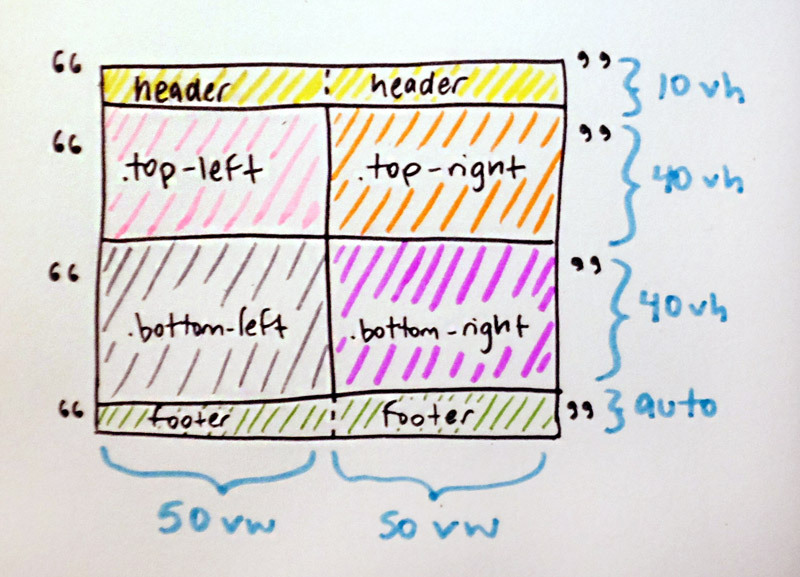 Since Flexbox is a linear layout property, it can work well within a grid system, but isn’t the best solution to page layouts, which are both horizontal and vertical. They work together to make layout a dream. Take some time to explore these resources and find out what all of the hype is about.